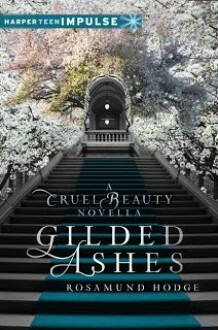 A romantic and fantastical reimagining of the classic Cinderella tale, Gilded Ashes is a novella by Rosamund Hodge set in the same world as the author's debut novel, Sundered.Orphan Maia doesn't see the point of love when it only brings pain: Her dying mother made a bargain with the evil, all-powerful ruler of their world that anyone who hurt her beloved daughter would be punished; her new stepmother went mad with grief when Maia's father died; and her stepsisters are desperate for their mother's approval, yet she always spurns them. And though her family has turned her into a despised servant, Maia must always pretend to be happy, or else they'll all be struck dead by the curse.Anax, heir to the Duke of Sardis, doesn't believe in love either—not since he discovered that his childhood sweetheart was only using him for his noble title. What's the point of pretending to fall in love with a girl just so she'll pretend to fall in love with him back? But when his father invites all the suitable girls in the kingdom to a masked ball, Anax must finally give in and select a wife.As fate would have it, the preparations for the masquerade bring him Maia, who was asked by her eldest stepsister to deliver letters to Anax. Despite a prickly first encounter, he is charmed and intrigued by this mysterious girl who doesn't believe in love. Anax can't help wishing to see her again—and when he does, he can't help falling in love with her. Against her will, Maia starts to fall in love with him too. But how can she be with him when every moment his life is in danger from her mother's deadly bargain?HarperTeen Impulse is a digital imprint focused on young adult short stories and novellas, with new releases the first Tuesday of each month.